A man has died after taking part in a vodka drinking competition organised by a supermarket in Russia. 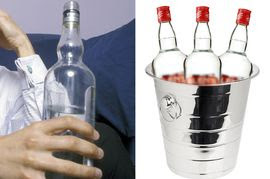 The 'Who Can Drink More Vodka' contest saw five participants rushed to intensive care, with one dying from consuming too much alcohol. The bizarre competition took place in the city of Volgodonsk in south-western Russia's Rostov Oblast region and was organised by a local supermarket called Saveliy. According to Daily Mirror, Police are believed to have started a criminal case against the shop for causing death by negligence as well as violating an advertising law which prohibits any action that stimulates the consumption of alcoholic beverages. A total of 40 men took part in the drinking competition which saw them down vodka which had been put in buckets. Salami and bread were offered by the shop to line the stomachs of the men, with the winner promised 10 bottles of vodka as a prize.